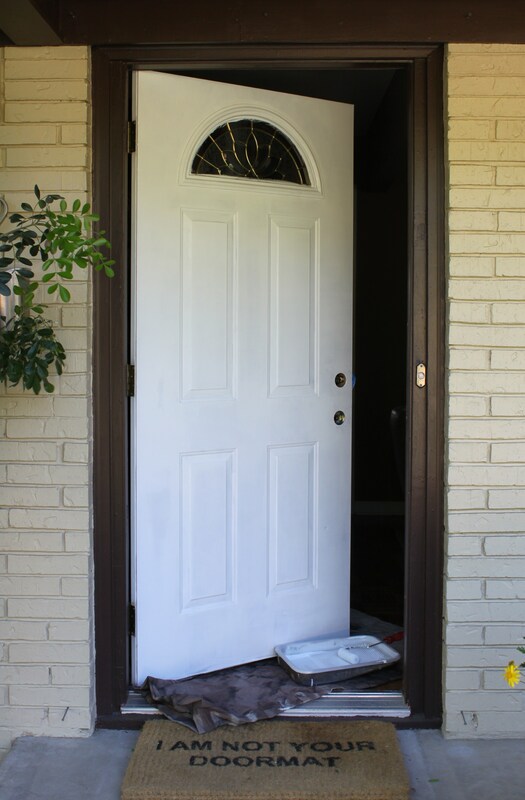 There is only one good thing about having a crappy front door that we don’t like……. …….Being able to paint it on a whim. For Christmas we slapped some Martha Stewart “Barn” on her just to coordinate with all the holiday decor out there. We loved it in December, and hated it since January. Time to take her back to a sunnier color. But, before we do. I have to properly cover over that red. Red is the hardest color to paint…and the hardest color to paint over. Many, many coats both ways. That’s why I start with Kilz 2 Latex Primer. Latex means that it’s not Oil-based and it cleans-up with water. It also dries quickly. Then I use a small foam roller to apply the primer. It was a beautiful warm day and 2 coats of primer dried pretty quickly. Tons better already…Am I right? 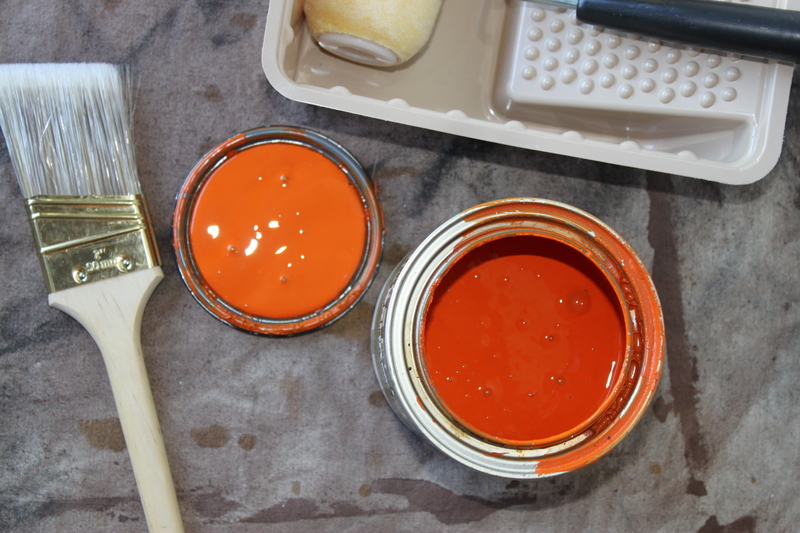 Now to pick a “Happy” color…..
Like Behr “Mandarin”. The perfect shade of “crayon” orange. There is no happier color on Earth. The trick that I’ve found with painting, is to use way less paint than you think you need. Don’t over saturate the roller or brush. 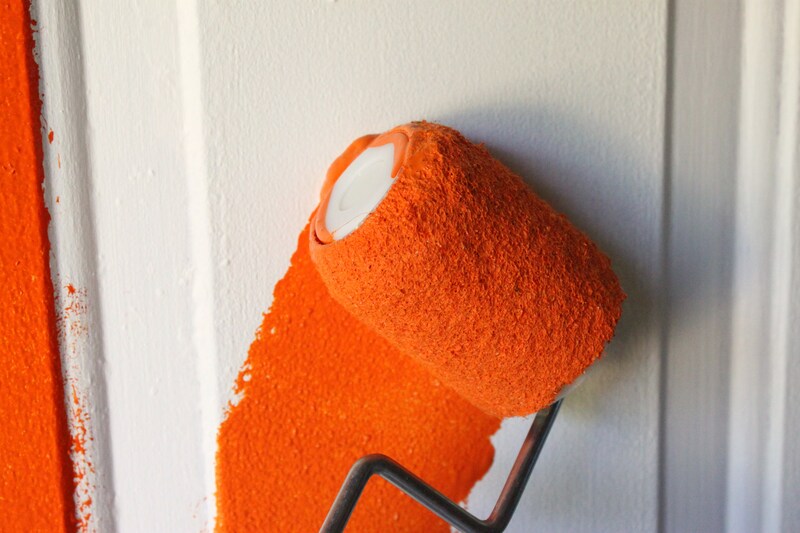 This will avoid drips…..
It’s much easier to add a second coat than to wipe away drips, so start slow. Trust me, I’m an excellent painter, and this is sound advice. 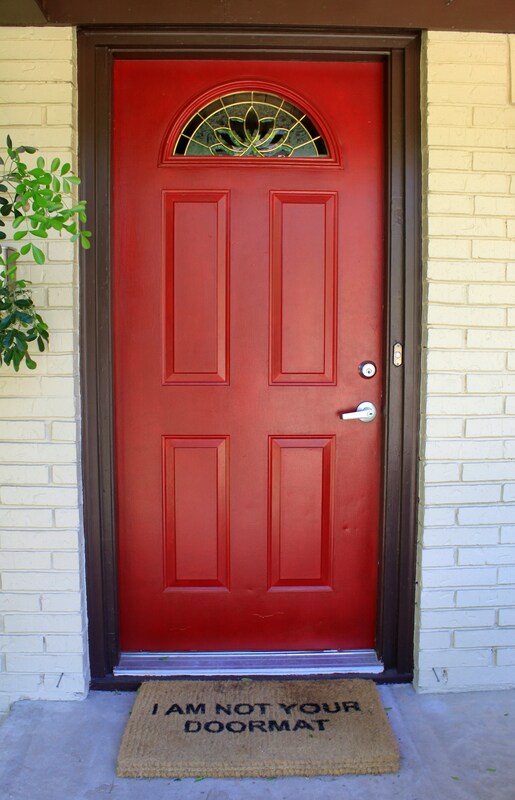 It took me about 2 coats of orange to cover the front door, way fewer than if I had tried to just paint over the red. 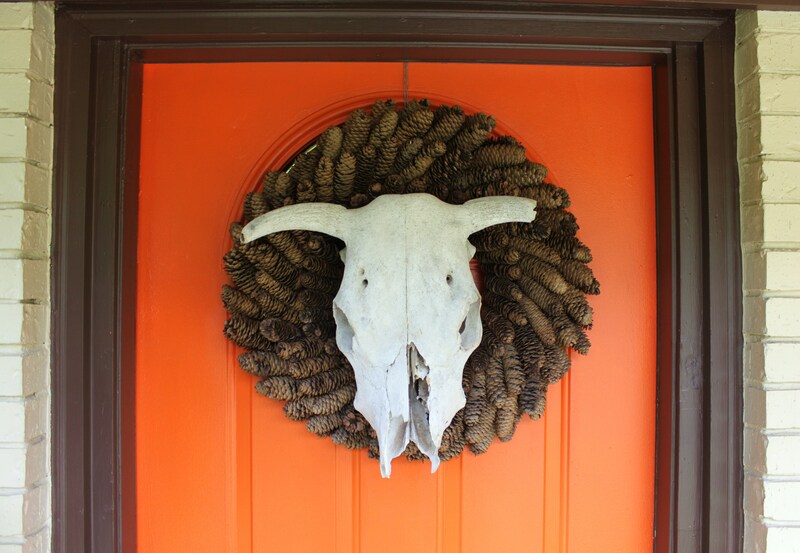 And yes, the cow skull-slash-pinecone wreath combo is back. Some people think it is a Christmas decoration…but it’s not. 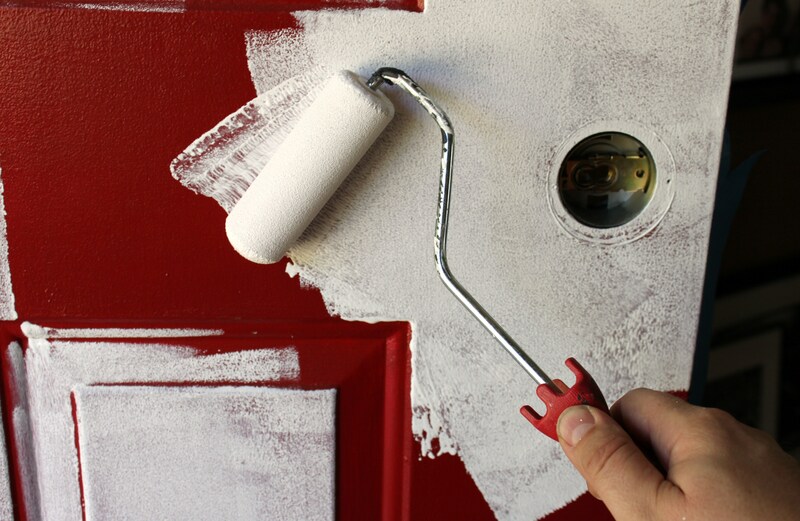 So we have no problem painting our front door when ever we feel like it…….’till we find a modern, wooden replacement. But then, that’s a whole other post. Wow!…I would have never thought to put “Mandarin” on a front door, but it looks GREAT!!! Thanks for the tutorial…you made it sound so easy. I’ve been so hesitant to paint my front door. It’s only paint…so paint away. Looks FABULOUS and I am not in the orange camp usually! Always love the changes you guys make! Awww thanks. Orange makes people smile. 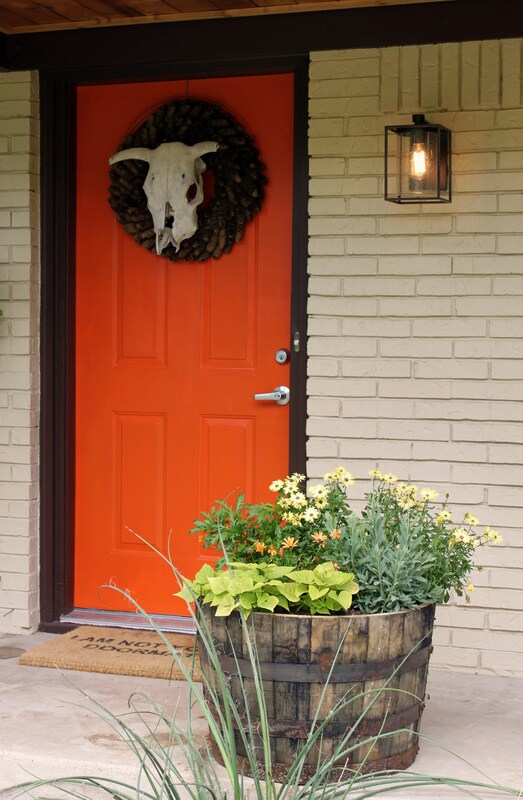 Love the color, so right for the skull wreath and new planter. As a bonus the Doberman looks good against as well. 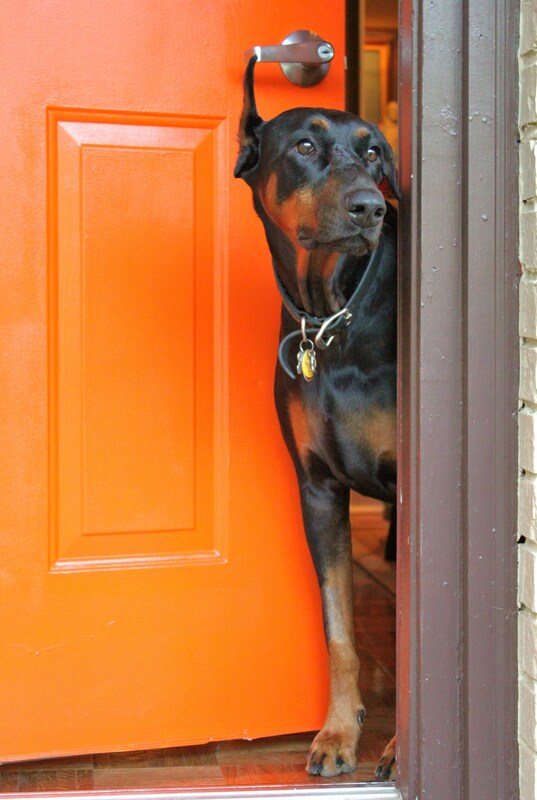 Took me 30 minutes of work to prove just how good that Doberman looks on a field of orange…..She wanted to join me. Hello! My name is Katy and I am the social media coordinator for KILZ Brand products. Great job on the front door transformation! Great color choice! We love to see that you used KILZ 2 to help complete your project! If you ever have any questions related to our products, go to our Facebook page at http://www.facebook.com/KILZBrand. Hi Katy, we wouldn’t use any other brand of primer. Kilz2 dries so quickly, and clean up is so easy. 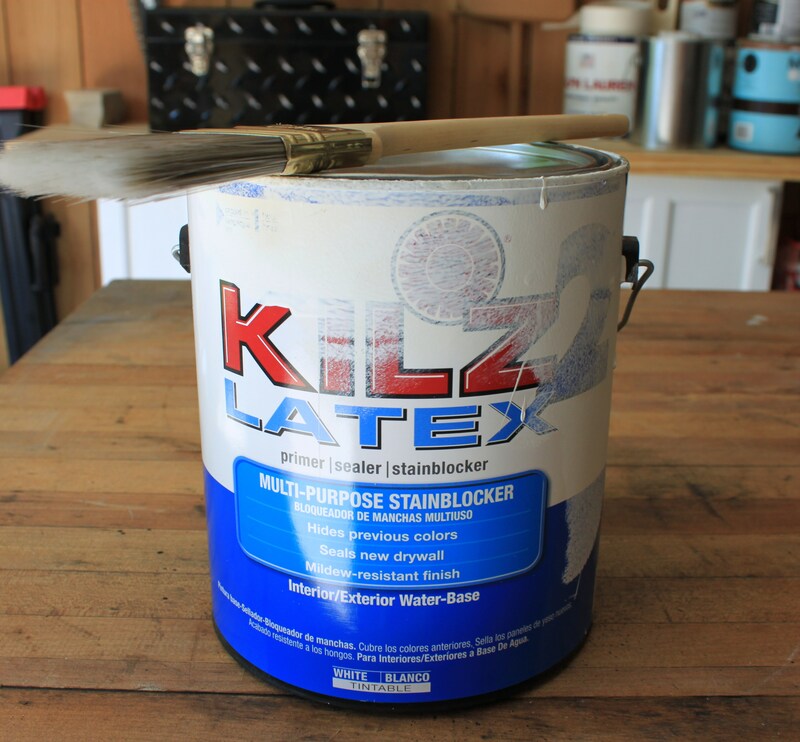 We use the spray primer all the time, and currently we are painting our garage ceiling with Kilz ceiling paint. Stay tuned to see how it turns out !